This is a big road game for Montana. Off to Cal Poly who has a 3 game winning streak going against Montana and who has recently given most Griz teams a series of incredibly tough games. Looking back on the last 10 years of matchups against Poly we’ve squared off 8 times, each team has won 4 games. The average score over those 8 games rounds out to 29-28 in Montana’s favor. However, Bobby as a head coach has only lost to Poly once, so while they’ve been a nemesis of late, history suggests he’s been able to manage them. For this Griz team to show they’re making the next step, they’ll need to show they can win on the road. Poly’s record could be a little deceiving as they’ve got one of the toughest schedules I’ve seen this year. 49-3 loss @ North Dakota State: It was 7-3 NDSU at the end of the first quarter… from there it got ugly. Poly was held to just 82 rushing yards and 125 passing, while their defense gave up 460 yards on the ground. NDSU barely had to pass the ball in the game, they averaged 10.2 yards per rush. 17-24 loss vs Weber State: Poly never lead in the game, and it was only tied at the start and at 10-10. While Weber could never pull away, Poly also couldn’t close the gap. Poly lost 2 fumbles and had a turnover on downs that killed a few drives. Meanwhile Weber didn’t flash the greatest stats, almost 200 rushing and 130 passing. There were 11 total punts in the game and it took less than 3 hours for the whole game to finish. Poly showed some good work on 3rd down as they tend do, while Weber wasn’t so great. As the game went on Poly got within 7 points with 3:30 left in the game and held Weber to a 3 and out. With the ball back Poly connected on a 17 yard pass to get into Weber territory, but on the next play their backup QB who played the whole game lost a fumble and ended the game. 44-15 win vs Brown: Now 0-2 Brown held it close for a bit, it was 17-15 Poly with almost 3 minutes until halftime. From there though Poly dominated scoring 4 TDs and held Brown to just 1 of 8 on 3rd down in the 2nd half and just 10 minutes of TOP. That gives Montana 7 more and Cal Poly 3 more with 1 push. The total is Montana 11, Cal Poly 5, Push 1. #5 Joe Protheroe, FB: Back for his senior year after losing last season to injury. Poly’s workhorse in their offense. 523 yards on the ground, 4 TDs, averaging 130 yards per game. We all know this guy and have seen him rip us apart before, he’s 5-11 and 230 pounds and will be the first option in the Poly rush game. #10 Khaleel Jenkins, QB: Jenkins started out 2017 as the starter but got hurt 3 or 4 games in. This year he’s missed a game on injury and was feared to be lost for the season again… but came back after a week off. He’s averaging about 50 yards per game rushing and 50 yards in the air. #1 Ju’wan Campbell, WR: The guy has just 30 yards receiving though, but also has 150 rushing and 2 TDs this season. #6 JJ Koski, WR: Probably the guy that gets the deep shot passes, he’s leading the WR group as really the only guy with major receiving stats. 243 yards in the air… but no TDs. The corners/safeties have to watch this guy, he’s their main target. #14 Broc Mortensen, SB: The 3rd threat in the rush game. Mortensen has 124 yards this season, which is about 40 yards per game average. #42 Matt Shotwell, LB: Brother of former Poly & Buch Buchanan winner Kyle Shotwell, he’s leading the team in tackles with 35. He’s got 3.5 TFLs, 1.5 sacks, and 1 recovered fumble. #46 Nik Navarrao, LB: Another young LB with Poly that’s making the most of his opportunity with the Mustangs. He’s 2nd on the team in tackles with 33 and leads the team with 5 TFLs and has forced 1 fumble. #8 Kitu Humphrey, S: The junior safety has 24 tackles and 1 fumble recovery, he also leads the team with 6 pass breakups. 1. Make the most of possession on offense. 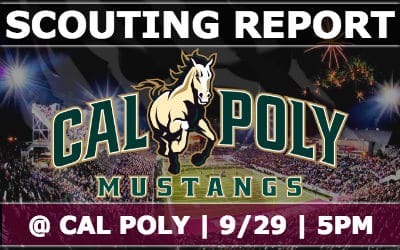 Poly is going to slow the game down and milk the clock. As some teams have shown when Poly really controls the clock they simply don’t allow the opponents to do anything. The Griz cannot afford a lot of stalled/wasted drives. 3. Grab some fumbles. Poly has fumbled 13 times and lost 7 this season already. The Griz have to get a few of them. 4. Don’t give up the deep shot. The Grizzly pass defense these last few weeks has shown issues in the pass game. Poly’s going to have 10 to 15 deep(er) pass shots in this game and if the Griz safeties aren’t ready it’ll result in some easy scores for Poly. 5. Weather the storm. This game will undoubtably come with some tough spots. These last two weeks showed the Griz can bounce back from some of those challenges, they’ll need to be prepared again to presumably face a lot of unknown, especially early. 6. Don’t give up long runs. It’s probably impossible to say “stop the run” but they have to contain Poly’s offense and not let Protheroe and company rip off long runs on the Griz. The Sac St game gives concern that this could happen too. Need to clean it up. 7. A big play or two on ST. Poly’s coverage stats are a little suspect, a JLM or Flowers long return or two would be huge. 8. 30+ points. I feel that with our young defense the Grizzly offense is going to have to put up some good numbers to help these guys out. I really think if the Grizzly defense doesn’t let the Poly run game totally torch them this should be a game they win. However Poly’s faced some tough teams and could be ripe to pull off the upset. I do like that Bobby’s teams tend to be better prepared for Poly than the prior few coaches we’ve seen, and I think this week the Griz get it done, but once again it’s going to be a little tense. I’ll go 38-32 Griz win.